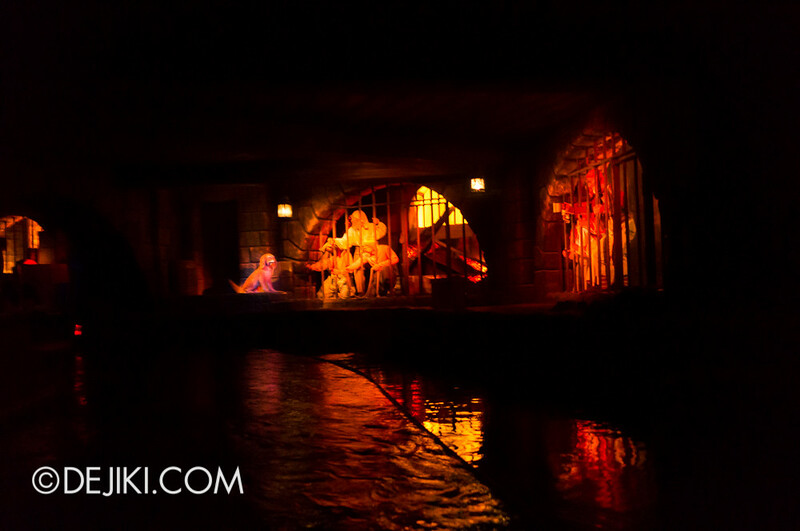 Pirates of the Caribbean is a boat ride located at Adventureland, Tokyo Disneyland. 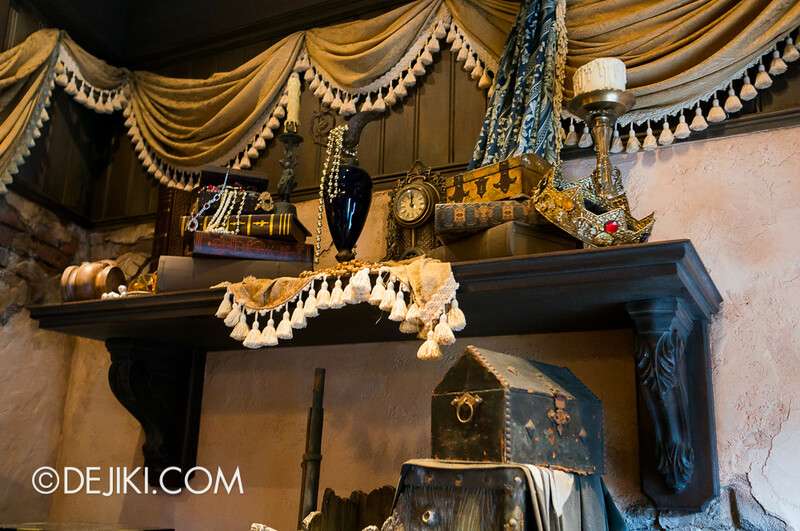 It brings guests on a voyage through time, narrating a story of pirates during (and after) the golden age of piracy. Originally designed in the 1960s, the ride is still impressive even today, and is to me one of the most amazing rides of all time. 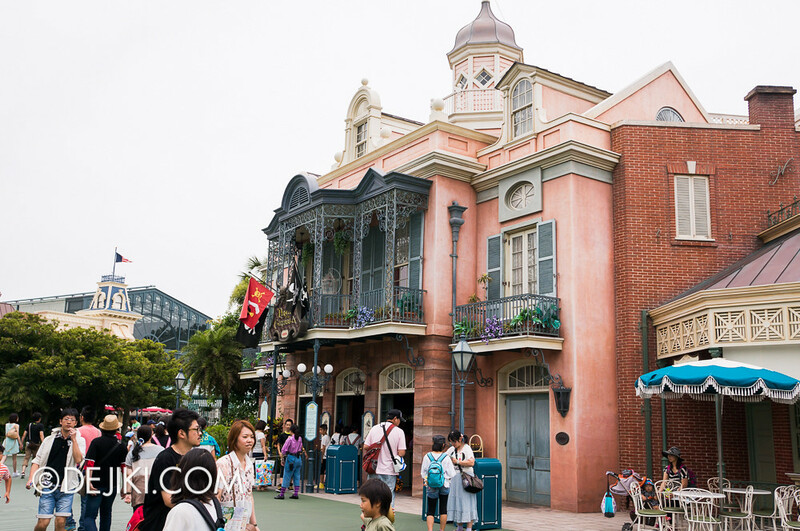 This version, at Tokyo Disneyland, was built in the 1980s. The attraction eventually inspired a major film series with the same name. 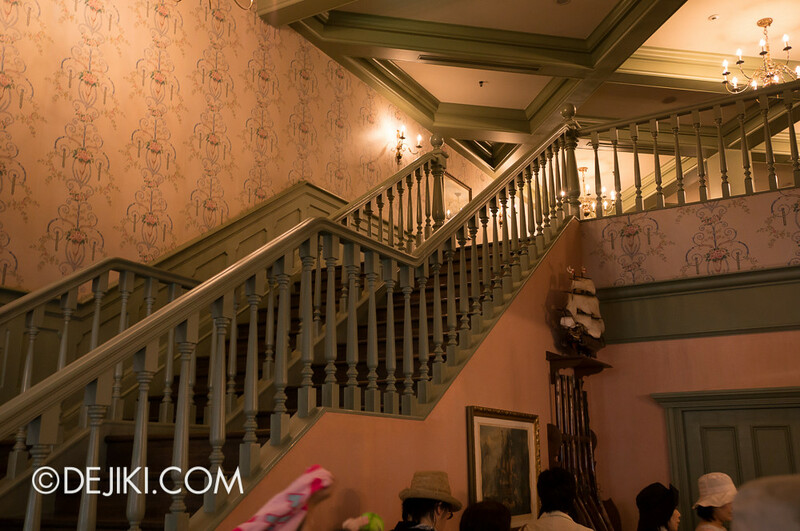 The Mansion, in the New Orleans section of Adventureland is where our journey sets sail. 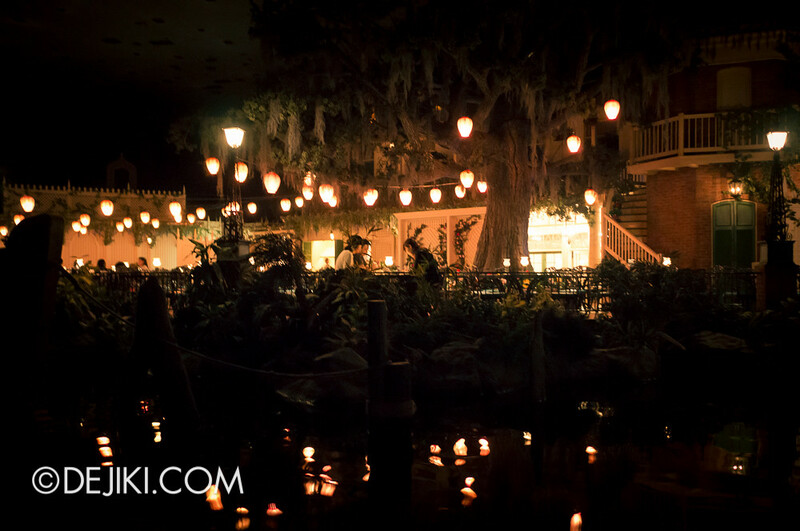 Upon entering the building, no matter day or night, guests will be transported to Blue Bayou, shrouded in a mysterious night sky. 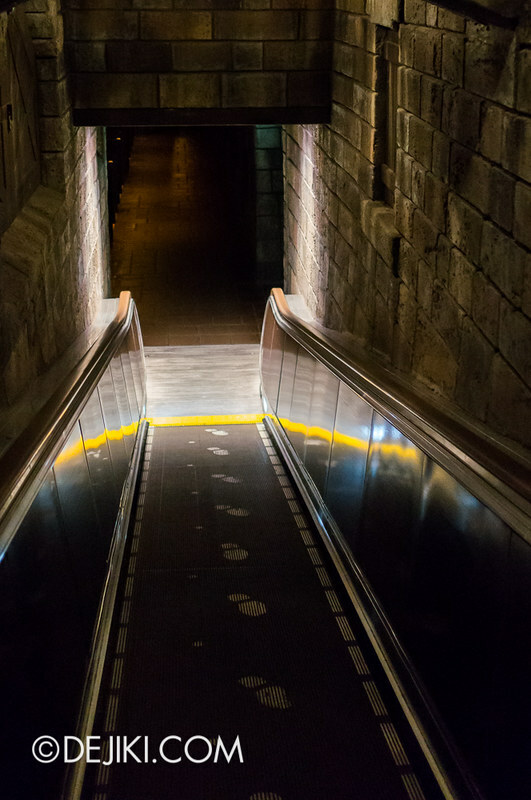 It is not jarring – the archways form windows through segments of a story. Empty boats floating beside the queue. 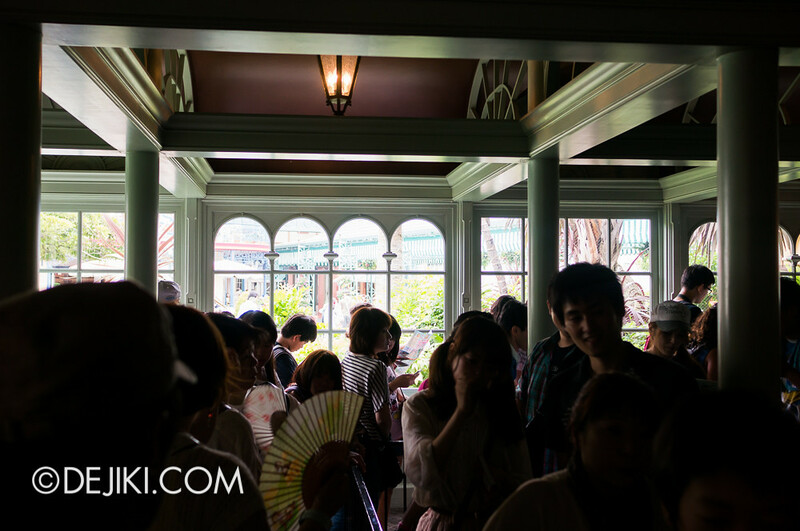 I believe the Tokyo Disneyland edition of Pirates has most of the queue indoors. 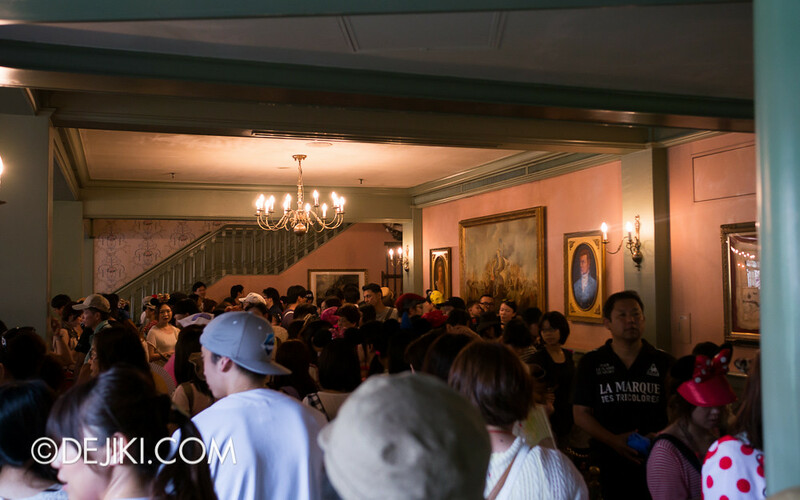 The line winds into a section of the mansion that faces World Bazaar. Does anyone know what is at the second level of the queue building? 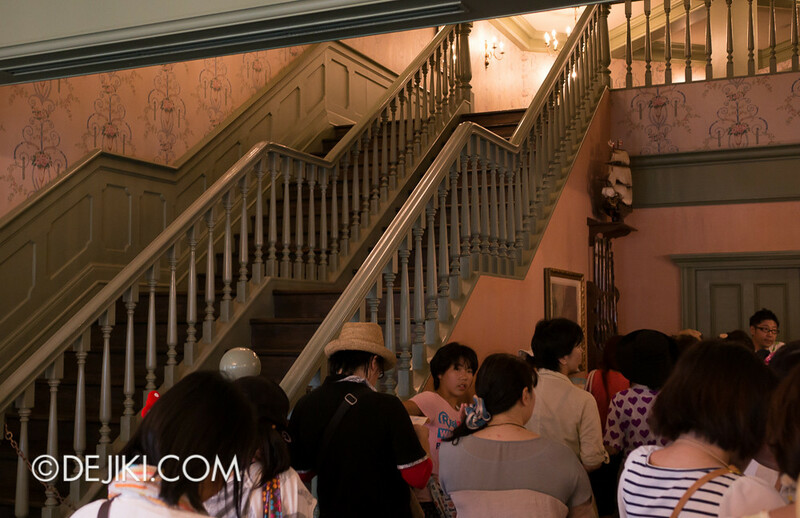 The same building at Disneyland (Anaheim) houses the special Disneyland Dream Suite. 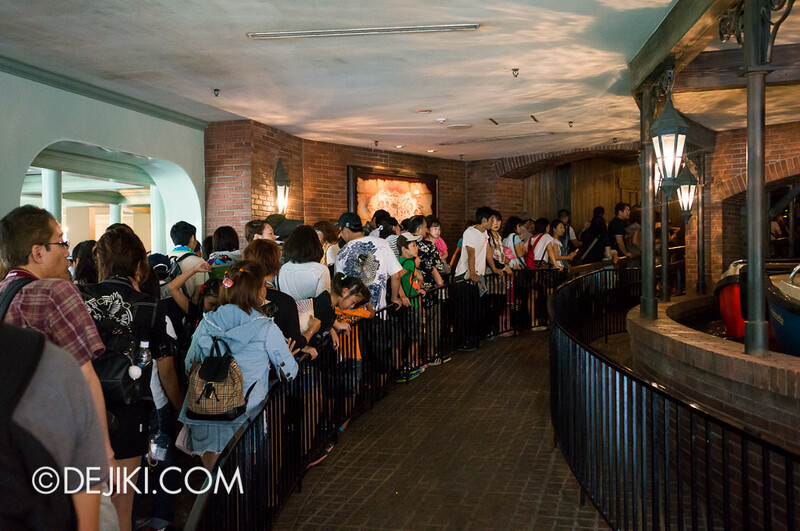 Here is a photo of the Mansion section of the queue, with no people. 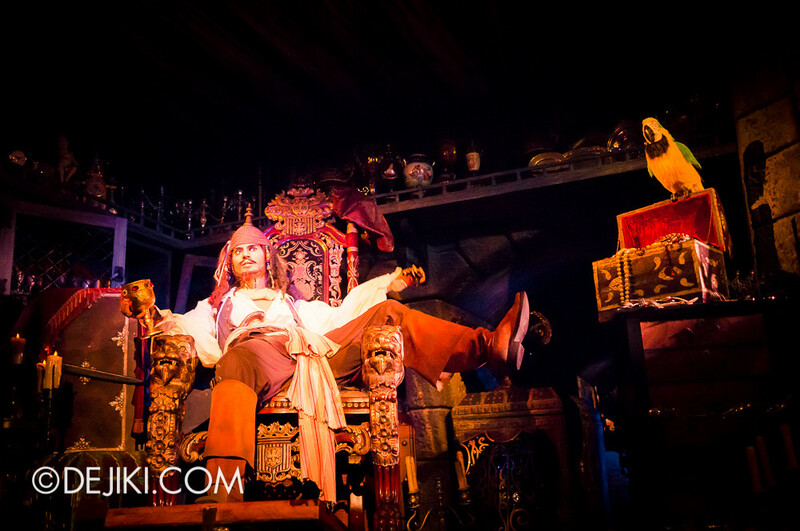 Pirates of the Caribbean is a popular ride, with wait times going as high as 40 minutes on an ordinary day. 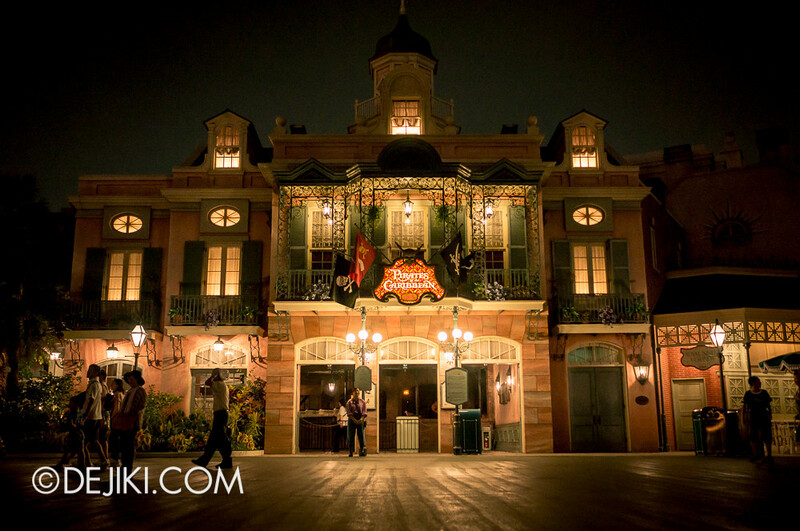 If you revisit in the evening however, there is usually barely anyone in line. 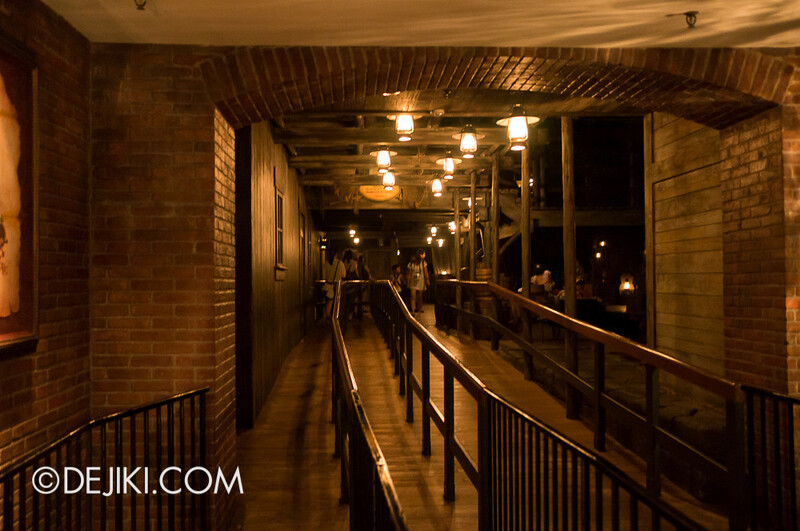 Under a brick archway, guests are transported into another place and time. This is the path leading to Laffite’s Landing, where guests board the boats. This ride is sponsored by Kirin. 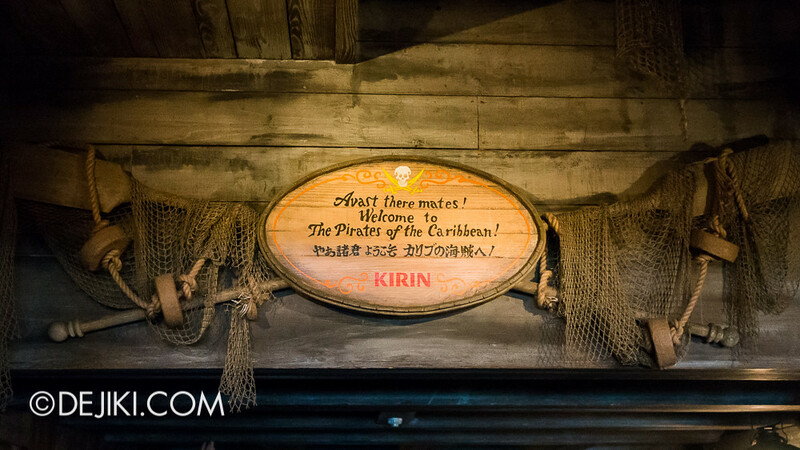 How many times did we get Kirin Lemon Soda during our days at the parks again? 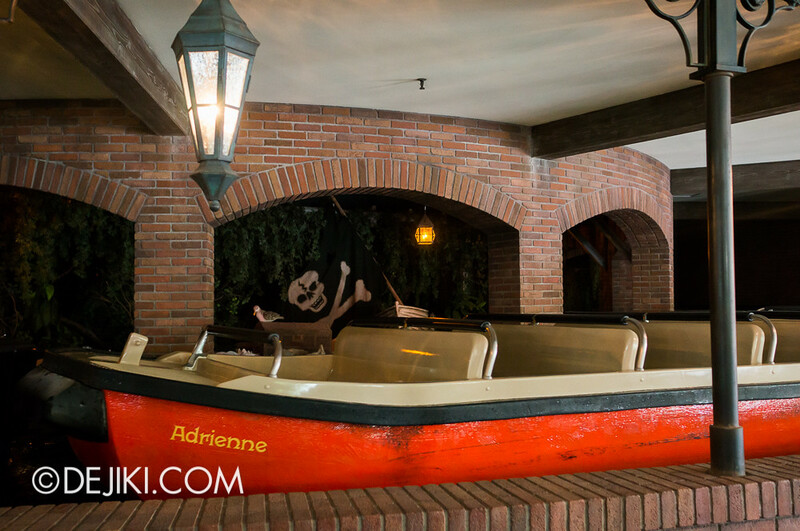 The boat floats through a peaceful outdoor restaurant, Blue Bayou Restaurant, which can only be found in three Disney Parks worldwide. It’s a peaceful scene – a few fireflies, gentle waves and starry sky. A soft banjo playing from one of the houses. An old man sits on a rocking chair, enjoying the breeze and soft cricketing of the fireflies. A talking skull, warning us about the perilous journey ahead. Beware! 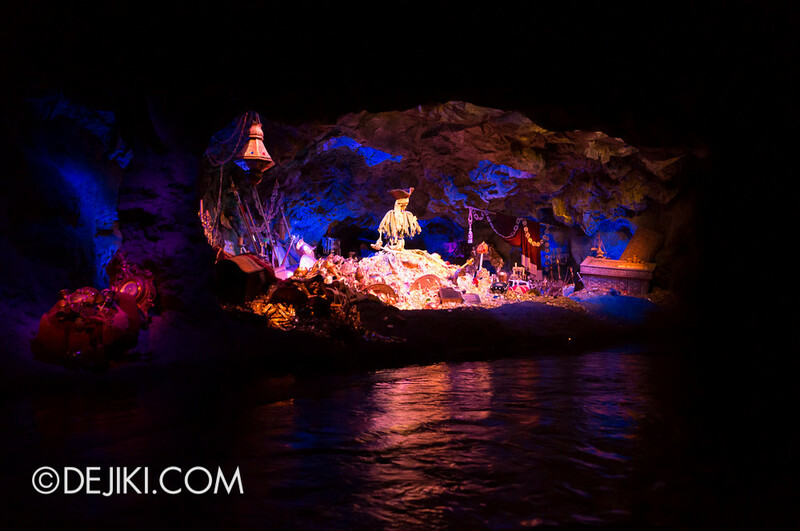 Right after this, the boat plunges down a waterfall into an abandoned grotto. 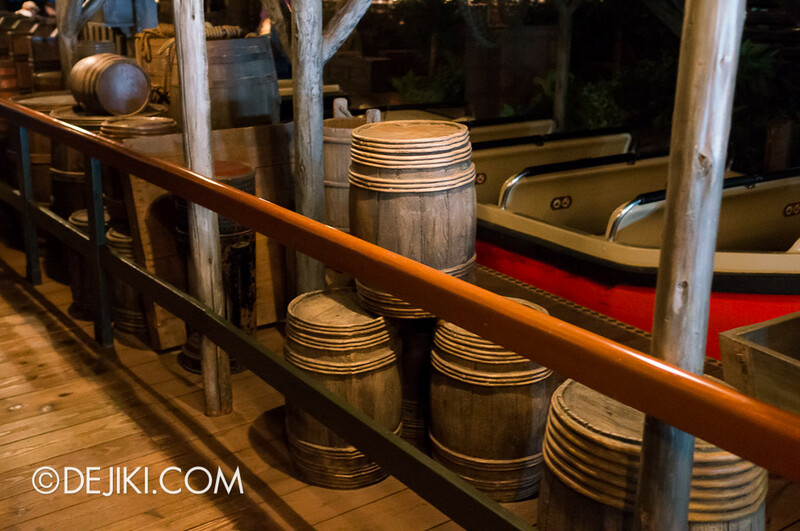 The ride is up to interpretation, but I prefer the option of the experience being a dream flashback sequence. A diminished, haunting melody plays while small waves sweep along the sandbanks. 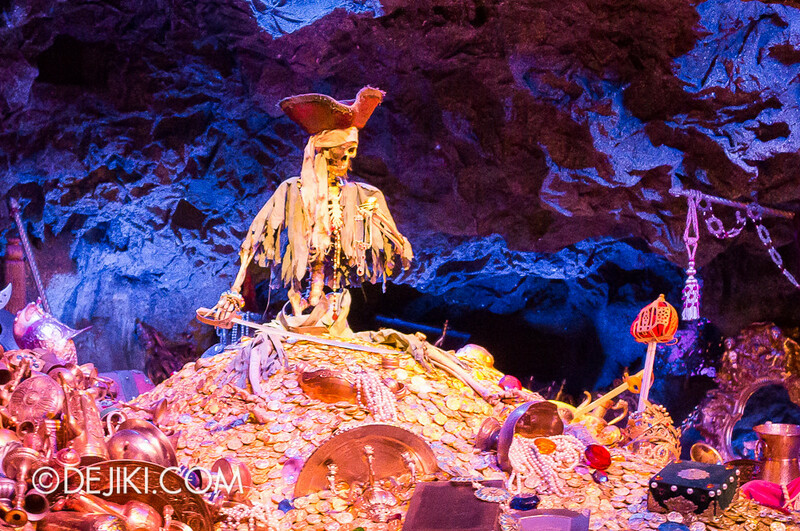 In Dead Men’s Grotto, we revisit a few scenes, all filed with pirate skeletons. This one shows the results of a fight. 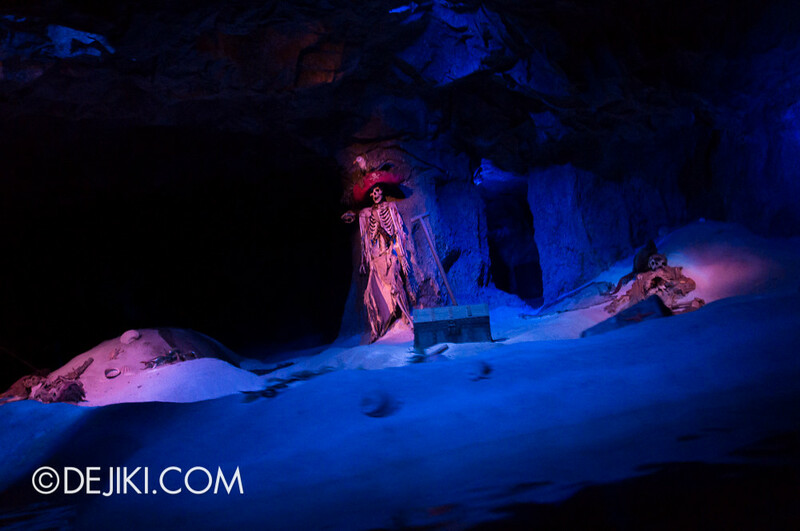 Then we see how some pirates spent their last days – steering a ship, drinking rum, playing chess and so on. The moody melody morphs into a chirpy instrumental version of A Pirates Life for Me. 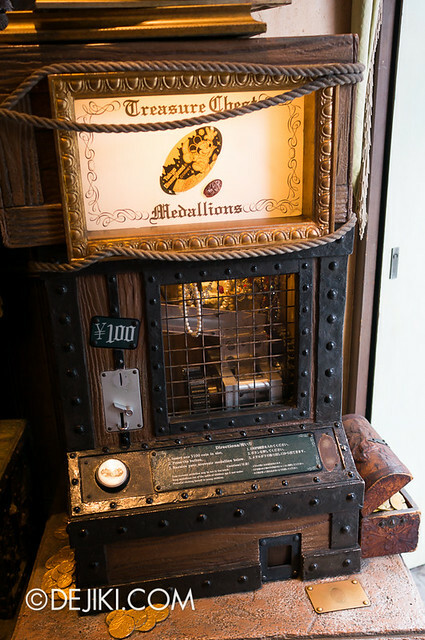 The fortune is not abandoned, as the pirates who plundered the gold remained. The boat sails through as he disappears. Drifting out of the abandoned grotto, we are then brought into another time. 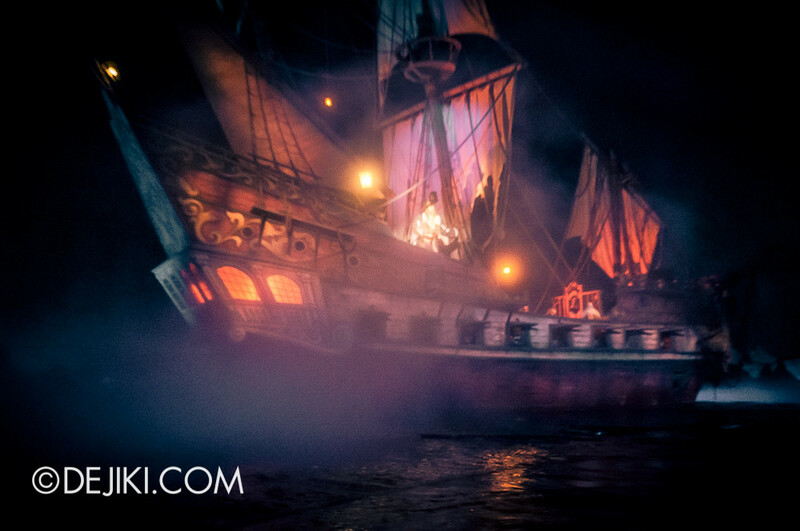 This time, we see Captain Barbossa attacking a Spanish fortress, demanding the surrender of Captain Jack Sparrow. 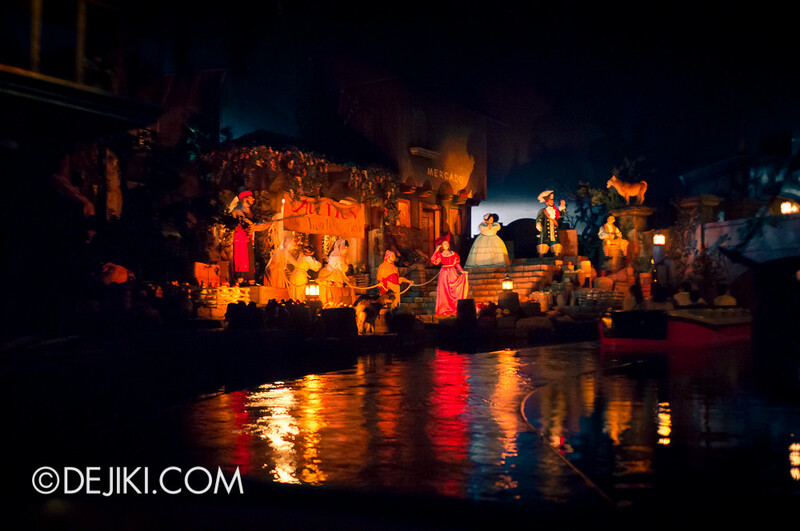 We then float through some of the ride’s famous scenes – when pirates have taken over the town of Isla Tesoro. 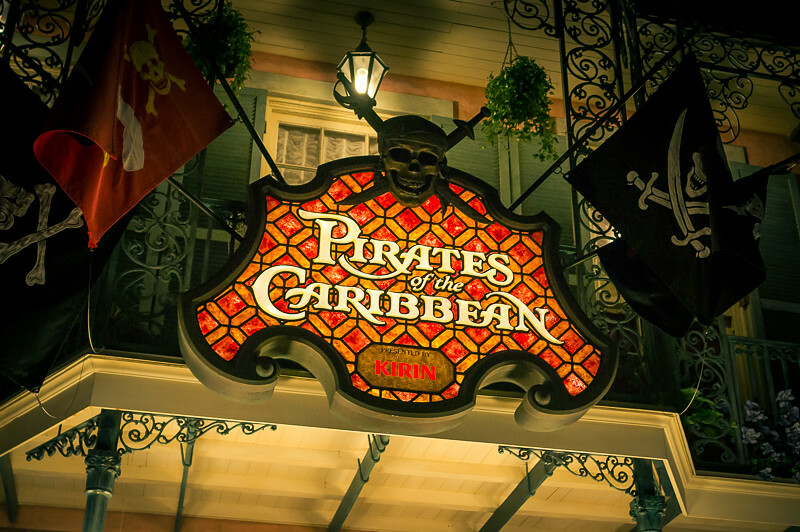 Over here, an Auctioneer sells the town’s women as brides for pirates. 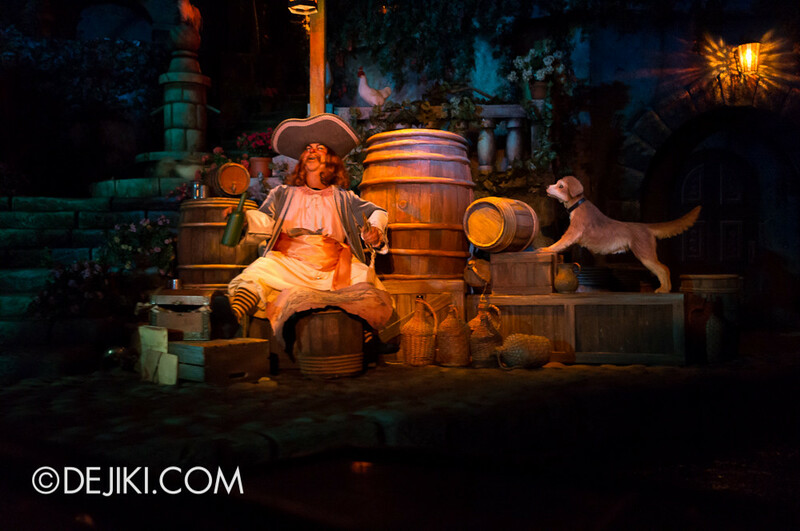 A drunken pirate, holding a key and map to a treasure vault, taunting Jack Sparrow (hidden in the barrel) that the famous pirate will not get to the treasure. 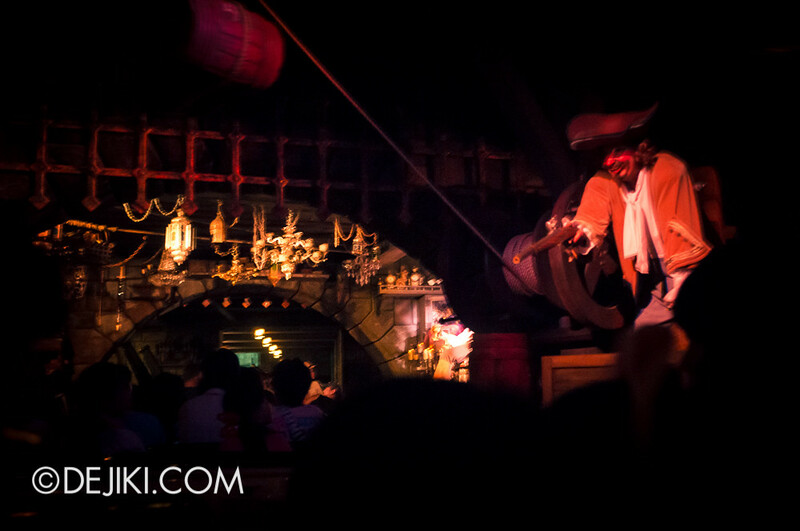 As he drinks, pirates chase women in the houses behind him. The pirates have looted the town and set the town on fire. 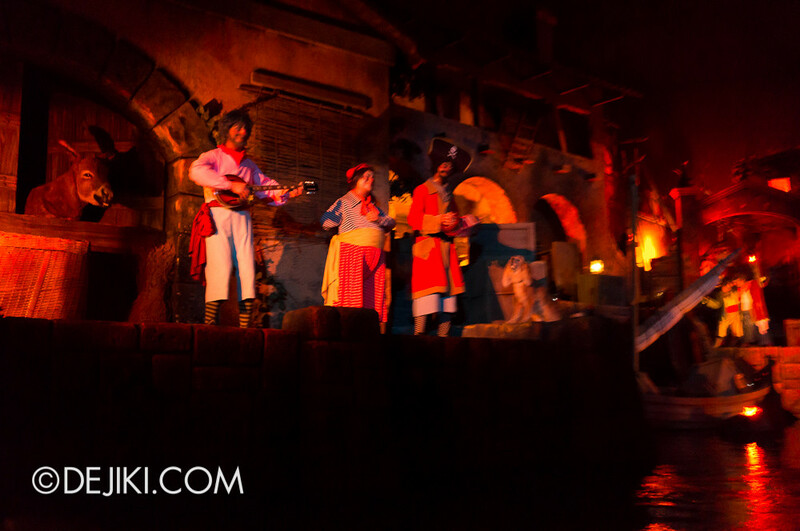 As this is happening, a few pirates assemble to sing “A Pirates Life for Me”. Some pirates try to persuade a guard dog to hand over the key to their prison, but to no avail. We pass the jail and drift into the town’s underground arsenal. 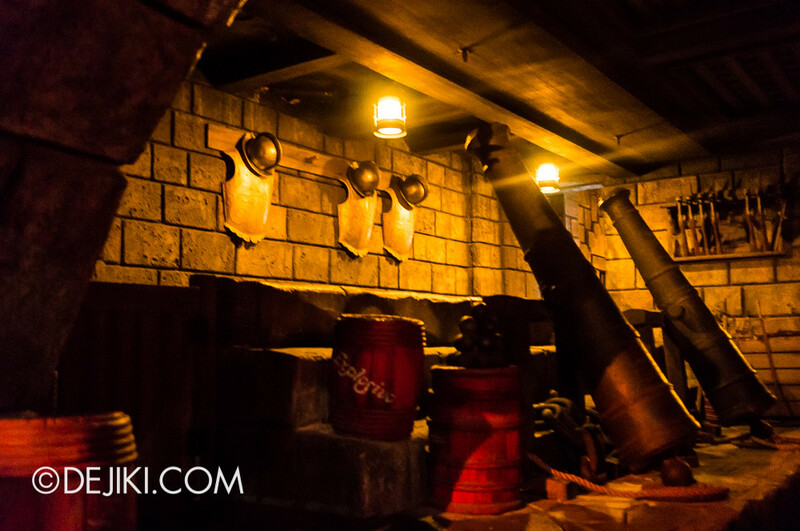 Still drowsy from the rum, the pirates continue singing and shooting at each other – unfazed by the amount of dangerous gunpowder in the chamber. Our boat narrowly escapes from the gunfire. 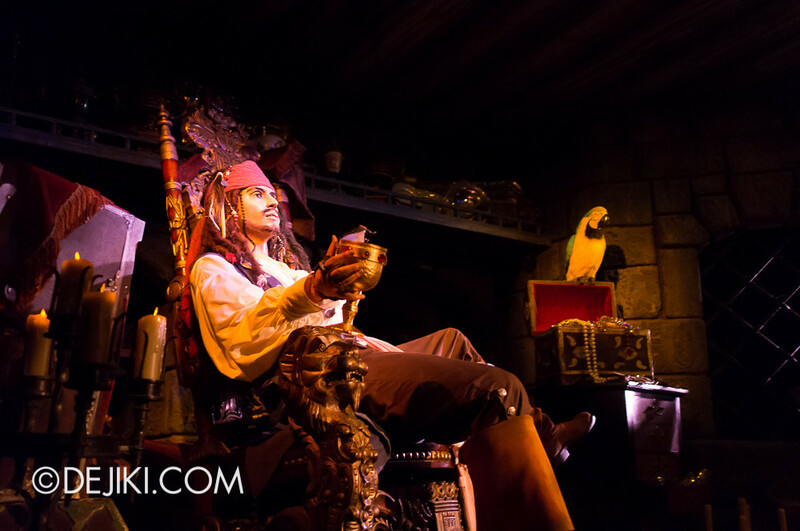 We meet Jack Sparrow again, who is also drunk and singing, reveling in his newfound riches. “Rascals and scoundrels, villains and knaves. 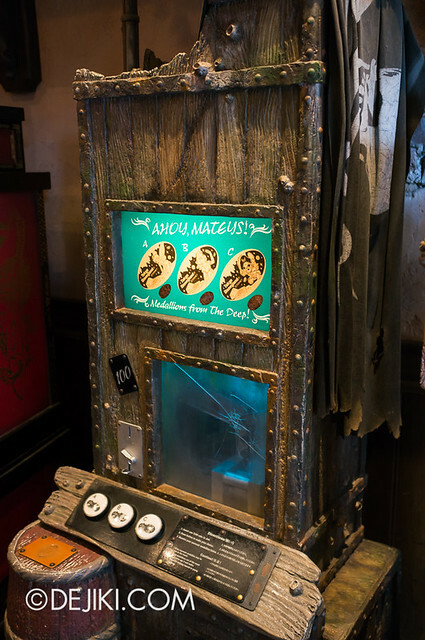 Drink up me hearties, yo ho! We’re devils and black sheep, really bad eggs. Drink up me hearties, yo ho! Drink up lads! 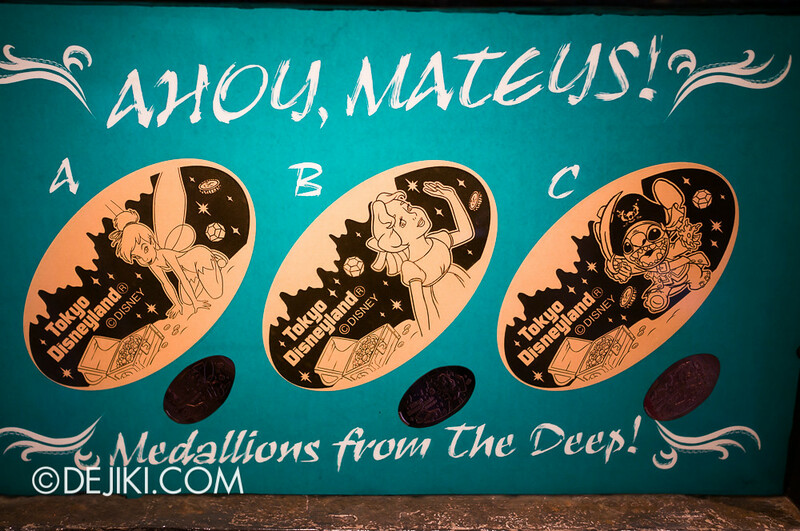 There’s treasure enough for all! I shall take this paltry sum as a stipend to cover my expenses, and a chest of jewels. In the safety of the other end of the arsenal, we disembark. Notice something really interesting about the travellator here? 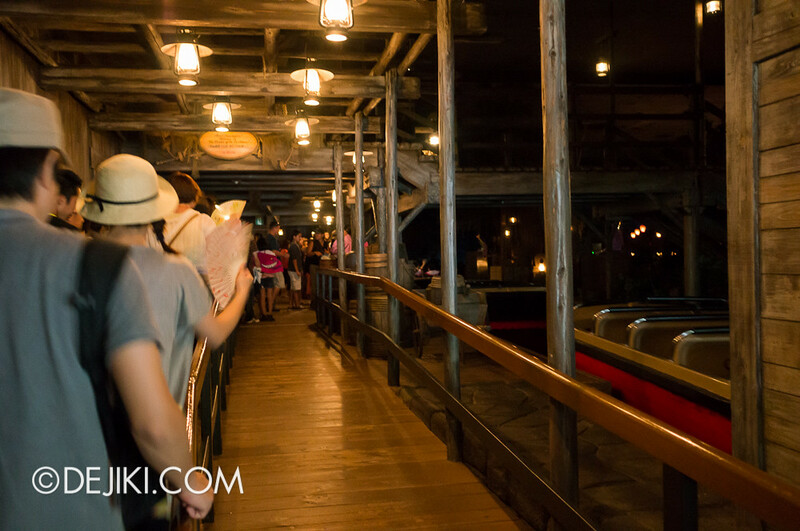 The ride exit goes straight out to the street, with two small shops along the pathway. I like how you don’t get pushed into a retail shop after leaving a ride. 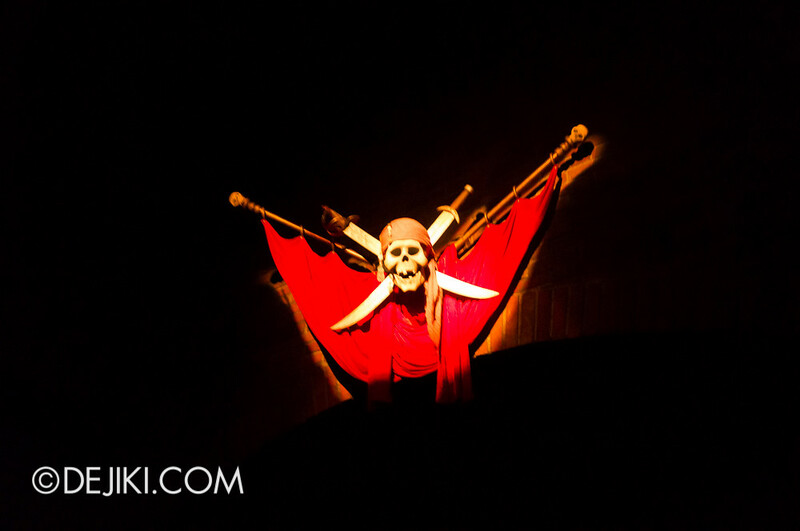 That wraps up the Pirates of the Caribbean experience. 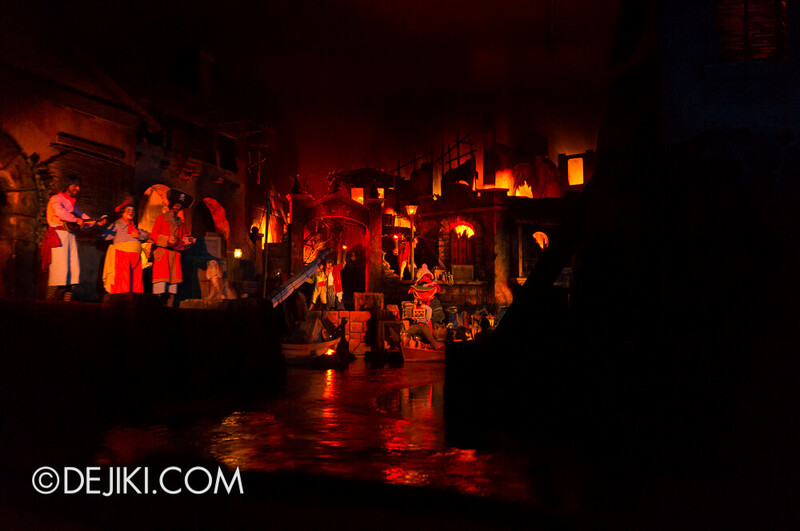 Apart from the new effects and Jack Sparrow animatronic figures (added in 2007), the entire ride doesn’t look like something built in the 1980s. The original version was created even earlier, opening in 1967. 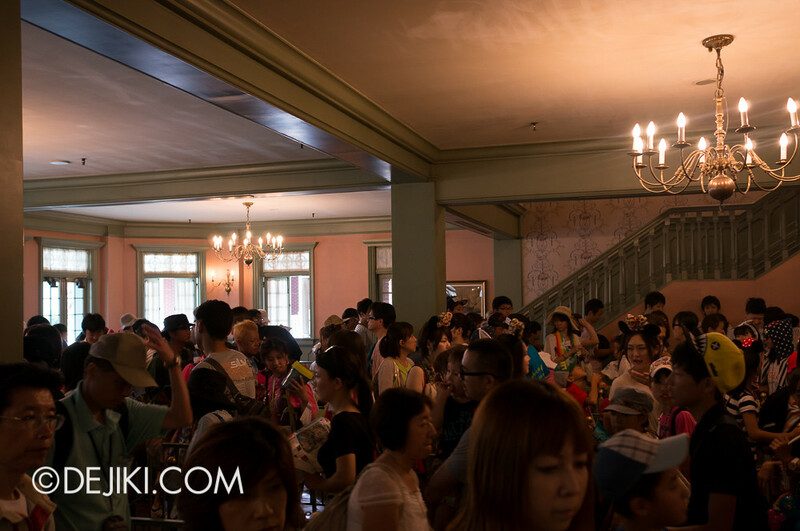 The amount of things to see on the ride is a spectacle – other than fluid movement of key characters (such as the famous Auctioneer), the town scenes are packed with other human characters with subtle movements, as well as small animated figures. Even the animals (chickens, pigs, cats and dogs!) move realistically! 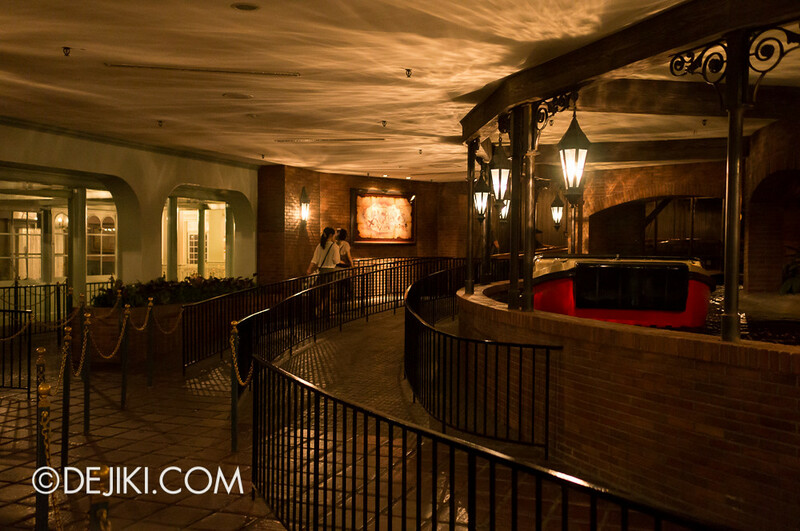 With so many intricate details to catch, this is one of those rides that I won’t mind going on several times a day. 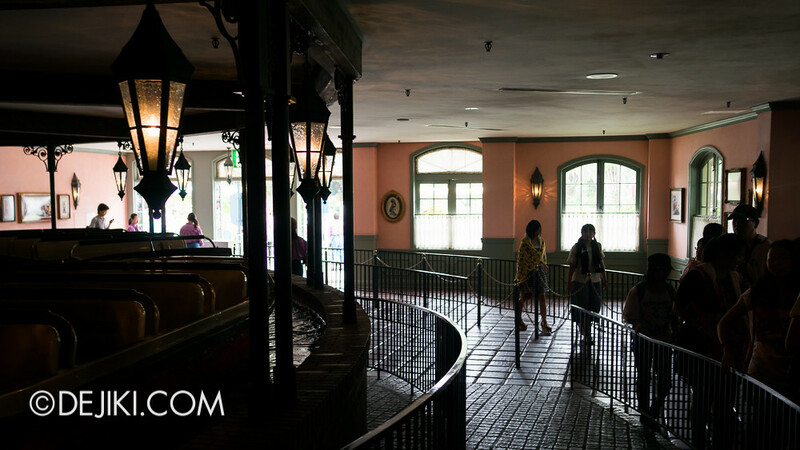 Magellan's | American Waterfront | Tower of Terror | Toy Story Mania! 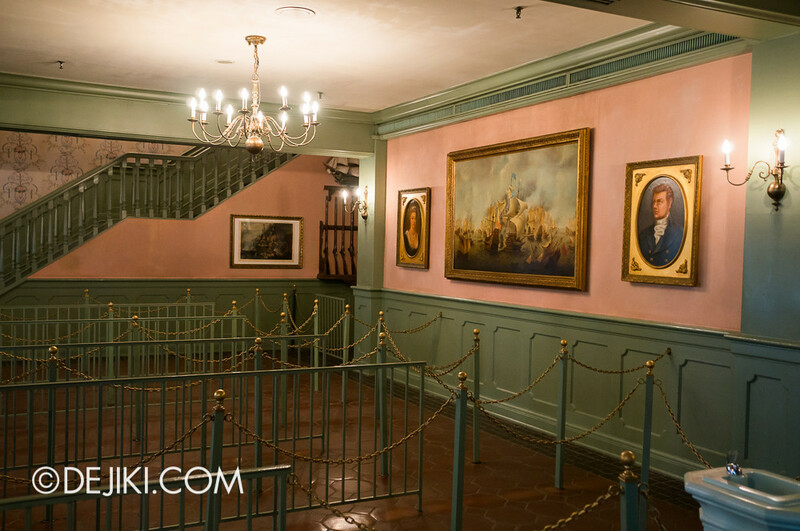 I’m not sure whats on the second floor but I remember when I visited, Jack Sparrow comes down from the second floor and greets the guest.